Two days after the peace negotiations in Wageningen, the first Allied forces reached the capital. In the evening after the tragic shootings around Dam Square and Central Station, the German Ortskommandant surrendered and gave his authority to the commander of the British reconnaissance unit: Major Hamish Richard Taite. It was always believed that it were the Canadians who reached Amsterdam that day, but this was cleared up by Tonny van Renterghem, member of the undergournd movement. 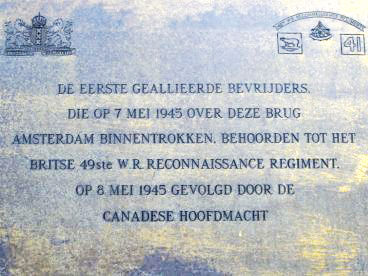 Through his effort, in the year 1995 a bronze plaque was fitted to the Berlage Bridge, stating that it was the British liberators who entered Amsterdam first on May 7th. It were the soldiers of a British reconnaissance unit, who were temporarily assigned to the Canadian Army. On May 8th the Canadian main force followed. Tonny van Renterghem was there in his capacity of chief of staff of the Ordedienst Binnenlandse Strijdkrachten Amsterdam-Zuid. In other words he was a constable in the interior forces, division Amsterdam-south. This Ordedienst (Constabulary) was commanded by J.H. Claus. The Constabulary resorted under Region 10 (roughly greater Amsterdam), of which C.F. (Carel) Overhoff was commander. The whole Domestic Forces fell under the command of H. Koot. Tonny van Renterghem describes how a jeep with trailer and four armored vehicles drove into the city on May 7. He was sitting in the first armored vehicle of the famous Polar Bears, and so he had a first rank view of the situation. Leonard Marsland Gander, journalist for the Daily Telegraph, wrote an article in The War Illustrated that later appeared in Dutch translation in Lichtspoor. In this article he stated that he climbed with Redfern in a jeep on May 7th, at the front of the British 49th West Riding infantry Division, part of the 1st Canadian Corps. The division was nicknamed the Polar Bears, because they had fought at the Battle of Norway at the beginning of World War II and also because part of the division was stationed in Iceland. The vanguard, led by Major Taite as vice commander, drove from Otterlo to Amsterdam via Hilversum. The group included No. 1 Troop (two heavy and two light trucks) led by Lieutenant George Bowman and No. 4 Troop (six Bren gun carriers) under Lieutenant John Rafferty. When Gander, dressed in British uniform with red beret, and guided by Van Renterghem had reached the center of Amsterdam, the Polar Bears retreated from Dam Square. There an explosive situation was created by a group of armed German infantrymen that came marching from the other side. The square was packed with a huge crowd. 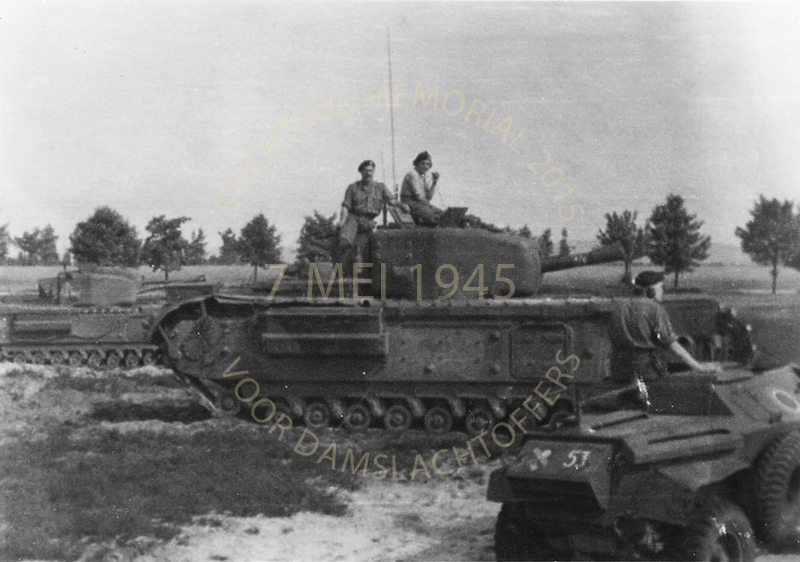 Two of the armored cars and the jeep remained waiting at the Amsteldijk to drive with the rest to the outskirts of the city. They transmitted their position to Headquarters. Meanwhile, shooting had started on Dam Square and at the Central Station. A while later they drove back towards the Dam, which was still the scene of heavy shooting. 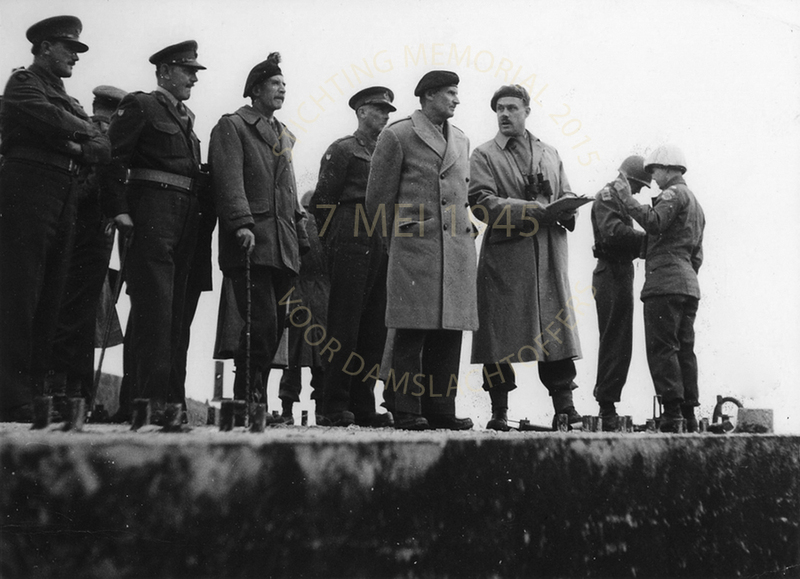 While they were conferring, Carel Overhoff took a white flag and started walking across the Dam. Major Hamish Taite and the rest of the B squadron had joined out of town with about ten armored cars in the exploration group. When the Polar Bears entered Amsterdam for the third time, Taite was there. At sunset they reached the office of the mayor. The second in command of the British reconnaissance unit 49th West Riding Infantry Division commander and temporary leader of B squadron Richard Hamish Taite, who invaded Amsterdam on May 7th, 1945, was a member of Kings Own Royal Regiment. Taite, who was always referred to by his middle name Hamish, was born on April 5 1911 in Westminster, London, the son of Geoffrey Charles Brindley Taite and Natalie Ernestine-le-Doux. Hamish Taite served in the British Army under serialnumber 52726. As Brigade Major to the 34th Tank Brigade, ranked Major, he landed in Normandy on June 30, 1942 on “Courseulles” beach. Fierce fighting ensued include Le Havre, ultimately leading to the liberation of Hilversum with the 49th West Riding Infantry Division Reconnaissance Regiment. He did reach the rank of Lt.Col in the 107th Regiment Royal Armoured Corps (King’s Own), which in June 1944 was part of the 34th Tank (later Armored) Brigade. Queen Wilhelmina awarded him the Bronze Lion, confirmed by Royal Decree of April 24, 1946 with this short description: “During the fighting for the liberation of the occupied Dutch territories having exhibited special courageous and discreet actions. In all respects a praiseworthy example under difficult circumstances. Hamish Taite was a famous cricketplayer. Between 1927 and 1939 he played for the European team in India. He got married in 1936 in Haverfordwest (Pembrokeshire) to Cynthia Fredrika Kreiser (1914-2012), the daughter of Waldemar Frederick Kreiser and Nettie Ruby Jones. Hamish and Cynthia had two children: Nathalie Margaret (1937) and Roger Geoffrey (1942). Hamish Taite died on April 5, 1969 at his home in Huttons Ambo, York. Of the 49th West Riding Infantry Division, which at the end of the Second World War engaged in heavy fighting against the Germans, 1,642 men were killed in battle. There were thousands of wounded. Thanks to son Roger Taite for the photos.